Photos and commentary documenting my boat building and sailing adventures. Every year for the last eight years or so Sally and I have attended B and B Yacht's small boat gathering. We often take the opportunity to explore the bays and rivers near Chapel Creek, the home of the Messabout. I have documented these trips in prevous posts. 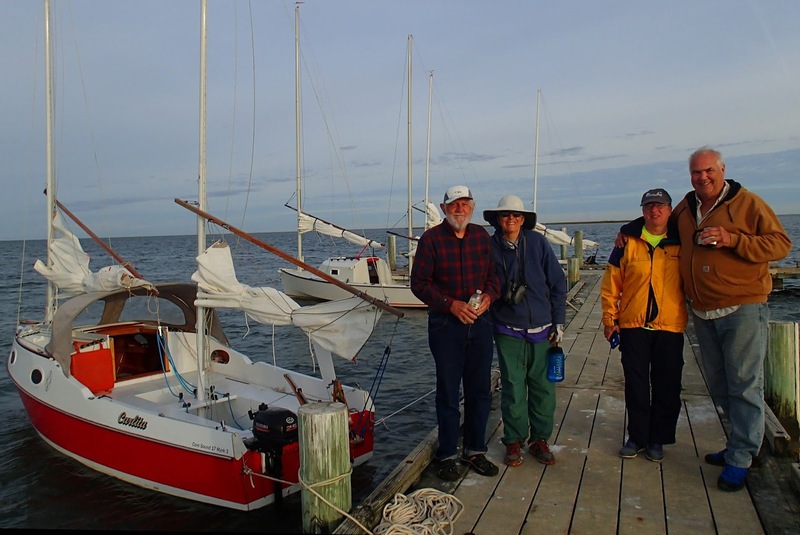 This year 2018 Sally and I in Skorpa, joined Jay and Carol in their CS 20 mk3, and Graham in his CS17 mk3 on a trip from Chapel Creek on the Bay River across the Pamlico Sound to the Outer Banks of North Carolina. We started with a brief captain's meeting. About 2pm Sunday we set sail down the river. Sally and I had double reefs as the wind was still gusting quite strong though would likely decrease as the afternoon wore on. The other two boats were partially reefed. 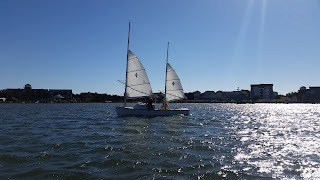 I thought that the other two boats would soon leave us behind because they had so much more sail up, but Graham later explained to me that as long as each of the boats had enough sail up to drive their boat up to hull speed that the boat with the longer water line would be faster. On top of that the EC22 hull is more easily driven up onto a plane and thus beyond its hull speed. Some of the gusts were still strong enough to send us a little beyond hull speed so to my surprise we pulled ahead of them. Every now and then we would double back so we could enjoy the sail down the Bay River together. 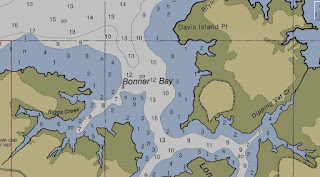 Around sundown we headed into Bonner Bay and found a quiet anchorage in Riggs Creek. As we drifted back on our anchor we came along side of Graham's boat so we rafted up for the evening and shared some after dinner tea and chocolate. I carried our stove box out to the cockpit and cooked our meal out in the open. You can see the stove glowing in the photo. There were no mosquitos! We decided to leave in the morning at 7:30am to allow plenty of daylight for our crossing. We had a north wind around 10 kts. Absolutely gorgeous conditions. Jay took this photo from Southern Express as we set out across the Pamlico Sound. Carlita is in the center and Skorpa is off to the right. An advantage of sailing in a group is you can get some great shots of your boat from your fellow sailors. This is Skorpa heading across the Pamlico Sound to Portsmouth. As we approached Portsmouth I could see that Graham and Jay were heading further East toward the Wallace Channel so we headed up to join them. When we were about 5 miles out the wind faded on us. Jay and Carol motored in. Graham waited for us near Shell Castle then he too headed in and we followed. Graham and I headed west shortly after rounding Ayers Rock while Jay had seen a large Sport Fishing boat leaving so he proceeded further south in the Wallace Chanel before heading West on a heading of 255 degrees. That was the channel we would use when we left for Ocracoke. Graham and I had to feel our way across the shoals. 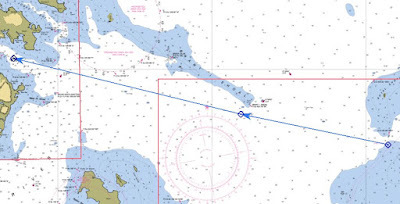 It is also possible to approach Portsmouth from the West. The preferred route depends on the tide and the set of the currant. We had about half tide and a flood currant. Coming into the dock at Portsmouth. Jay and Carol greeted us and helped us tie up. The mosquitos were out in force so we all decided to retire to our cabins. We put up our screens got rid of the skeeters that had snuck inside and fixed our dinner. That was by far more rowing than we had ever done in Skorpa much of it was against the current and Sally had done more than her share of the rowing. We had a quiet night, though I did notice that sometime after midnight the current reversed. We were treated to a beautiful sunrise. This is looking across Ocracoke Inlet. Monday morning as we are about to set off on a walk around Portsmouth Village. From left to right that is Graham, Sally, Carol and Jay. Sally and Carol are crossing one of the tidal creeks that wonder through the village none of which is more that a few feet above high water. Native Americans had been living on or visiting North Carolina's Outer Banks for centuries. The first permanent English settlement began in 1753. Bath located near the mouth of the Pamlico River was the first English settlement in North Carolina. The most direct route to the Atlantic was through the Ocracoke Inlet. 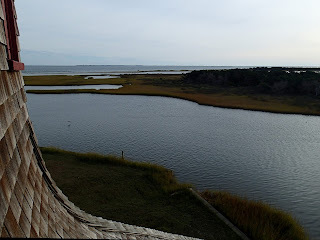 The inlet and Pamlico sound were to shallow for ocean going ships so in 1753 Portsmouth and Ocracoke were founded in order to provide piloting and lightering services to ships wanting to make their way across the Pamlico Sound to Bath. Bath was the nominal capital of the colony and much of the commerce in and out of the state went through Bath and the Ocracoke Inlet. Detail from a 1775 map. Portsmouth vessels would meet the incoming ships and cargo would be off loaded onto the lighters until the ship's draft was reduced to the point that they could navigate the inlet and shoals of the sound. There were so many vessels passing through the area that in 1894 a pretty swiz United States Life Saving Service Station was built that still stands there today. 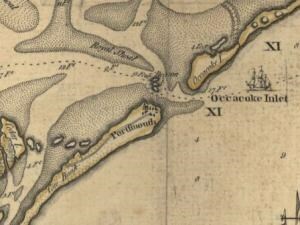 In 1842 1400 vessels passed through Ocracoke Inlet. 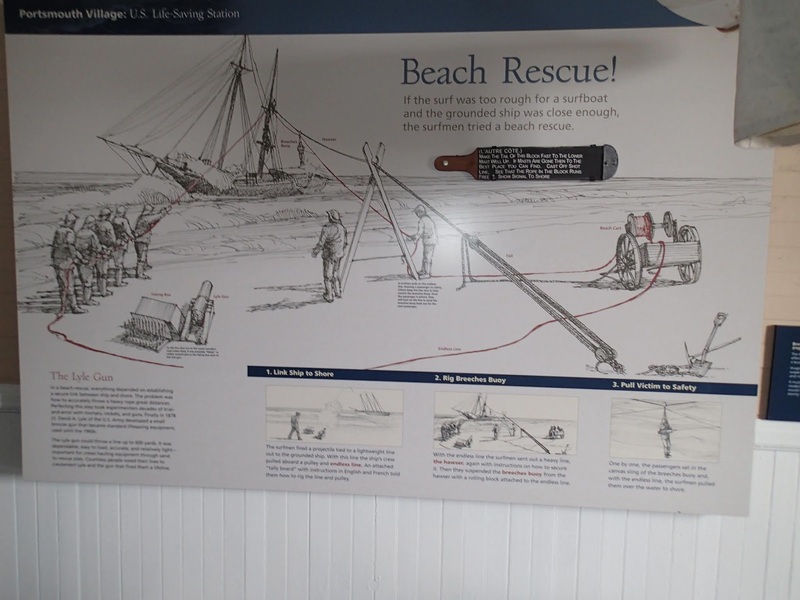 However a hurricane in September 1846 cut a new inlet through the Outer Banks near Hatteras. This inlet is wider and deeper than the Ocracoke Inlet. Portsmouth began to lose its position of prominence in North Carolina shipping. 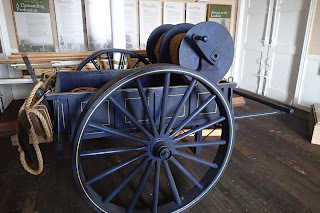 This site has some more of the History of Portsmouth. 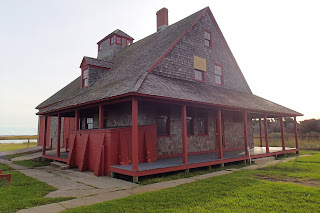 The Portsmouth Life Saving Station modeled after one designed for Quonochontaug, Rhode Island is maintained along with the other buildings of Portsmouth Village by the National Park Service. 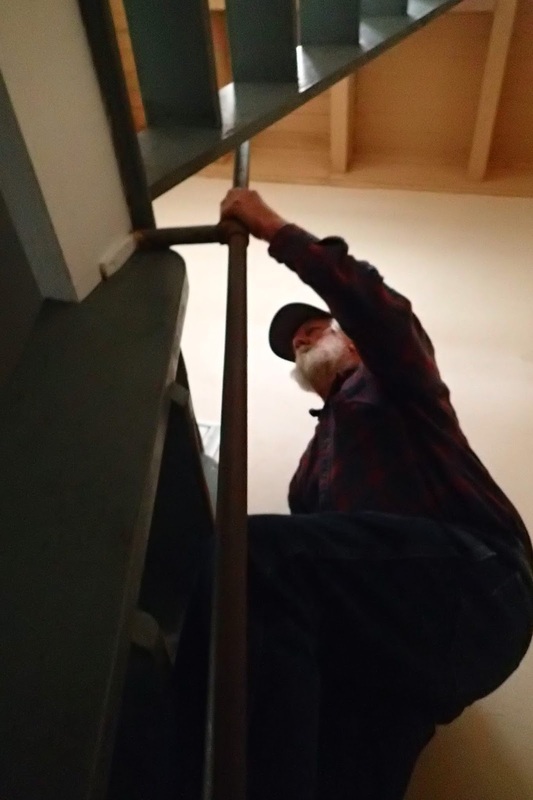 Graham is climbing the stairs to the observation room. Below is the view West. 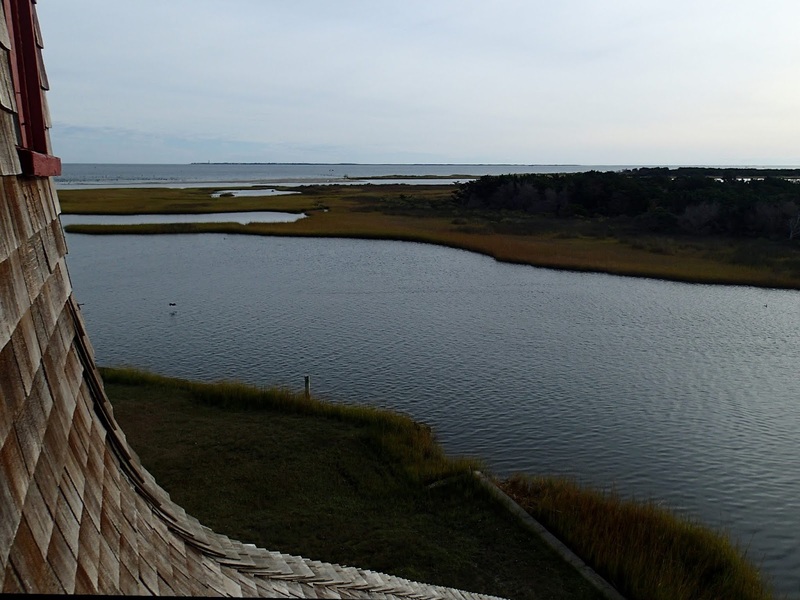 Here is the view East across Ocracoke Inlet. Graham asked me if I knew what this was. I told him I thought it might be a device for laying out rope so it would not tangle when it was rapidly deployed. The rope was attached to a Lyle gun which fired a projectile carrying the line out to the ship in distress. 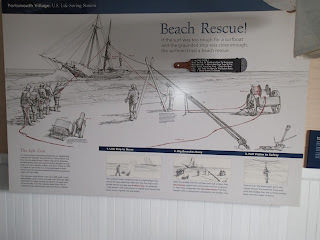 The light line was then used to pull out a heavier line so a breeches buoy could be pulled back and forth removing passengers from the vessel one at a time. This system was used for wrecks that were with about 600 yards from shore. Further than that boats were used to reach the vessel in distress. Just southeast of the Life Saving Building is a path that leads to the beach. There is suppose to be good shelling and a beautiful beach but as I followed the path it entered a thicket and the mosquitos quickly swarmed all over me. I retreated to the open and headed back to the boats. At the dock private boats were bringing tourists over from Ocracoke. Two boats came in while we were there. We spoke with the captains to get some tips on how to avoid the shoals on the way over to Ocracoke. Sally is cleaning up a bit prior to our trip across the Inlet to Ocracoke. Ocracoke is much higher above sea level. They have some beautiful trees. We rented a golf cart and saw some of the highlights. A German U-boat sunk a British Naval vessel during World War II. The bodies of several British sailors washed ashore and are buried here. This is a tree on the lighthouse grounds. I love its twisted trunk and the pruned and asymmetrical shape. 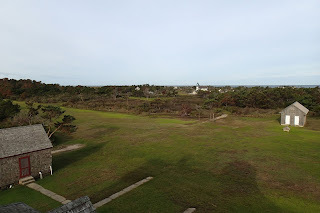 The Ocracoke Lighthouse was built in 1823 and stands 75 feet tall. It is still in operation. Monday night we had dinner at a local restaurant. Weather forecast was calling for winds from the Northwest at 20 to 25 knots. We decided if it was indeed blowing that strong in the morning we would delay our departure. It was well past dark when we got back to our boats. Graham and Carol and Jay motored off to find a quiet place to drop anchor. Our anchor was well set, but we were fairly close to what would be a lee shore. I did not want to sail around in the dark to find another spot so I decided I would deal with the lee shore in the morning. 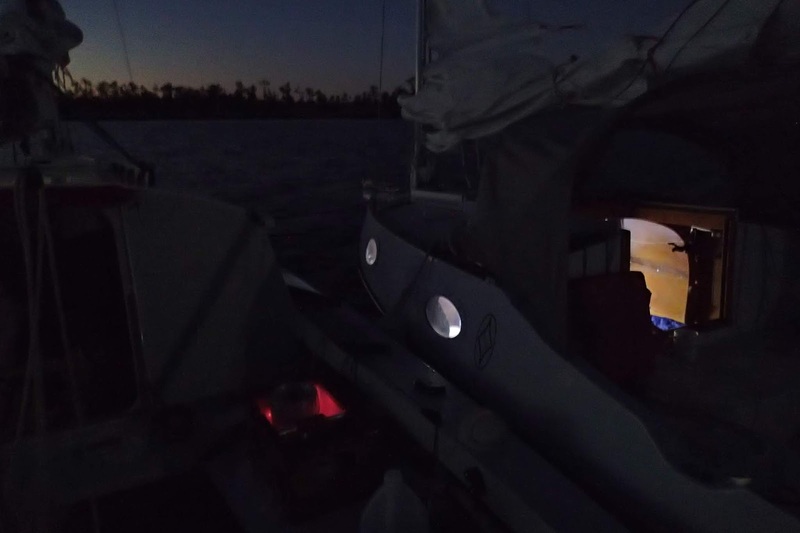 By 4 am the wind had picked up and veered enough that we were swinging up close to a dock. I sat in the cockpit armed with a paddle to push us off. We would swing into the dock. I would push off and we would swing back into the open. After a minute or two we would be up against the dock again. During the night I listened to the weather forecast and it was calling for the wind to drop below 20 knots by late morning. We decided that if the wind eased we would go ahead with the crossing. The morning dawned bright and clear. I set two reefs. We double checked the sheets centerboard and rudder. 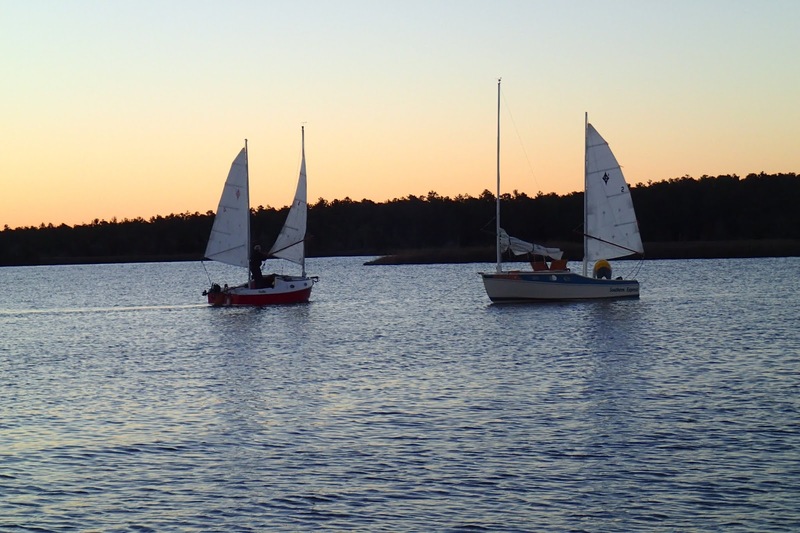 The wind was at 20 knots and we were pinned on a lee shore between two docks. We would have to get this right the first time. I went forward to weigh anchor. Once the anchor was free the boat started drifting back towards shore. I had to get the anchor the rest of the way up and stowed in the forward well and then make my way back to the cockpit. 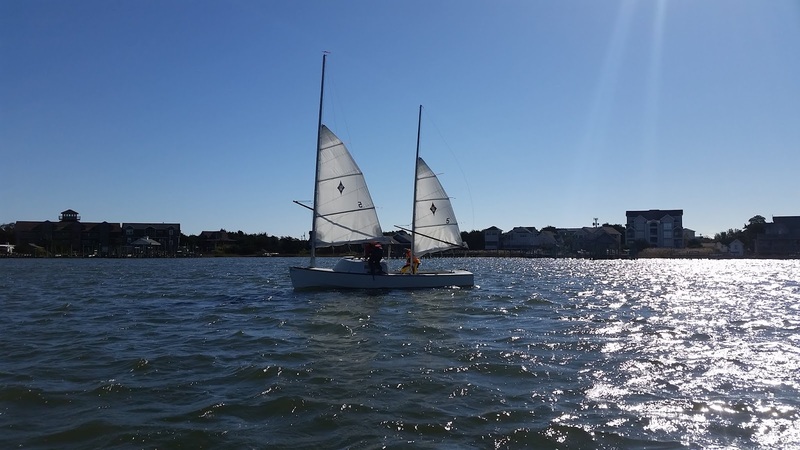 I pulled the mainsail over and off we shot on a port tack. We sailed back and forth across the harbor and out towards the sound. The wind was blowing over 20kts with stronger gusts. We could manage the boat fine in the harbor but we felt it was unwise to attempt the long unfamiliar crossing in these wind conditions. We dropped anchor near Graham and told him we felt it would be better to wait to see if the wind would drop off a little. We relaxed in the cockpit, by noon it was still blowing hard and we had some lunch. Finally around 1pm the wind began to ease. This was late in the day to be contemplating a crossing that could take 8 to 10 hours. Jay and Carrol decided they would stay another night. Graham said he was OK either way. It was really too late in the day but I did not want to delay our return. We began some final preparations and it was nearly 2pm when we waved goodbye to Carol and Jay and headed out of the harbor with Carlita leading the way. 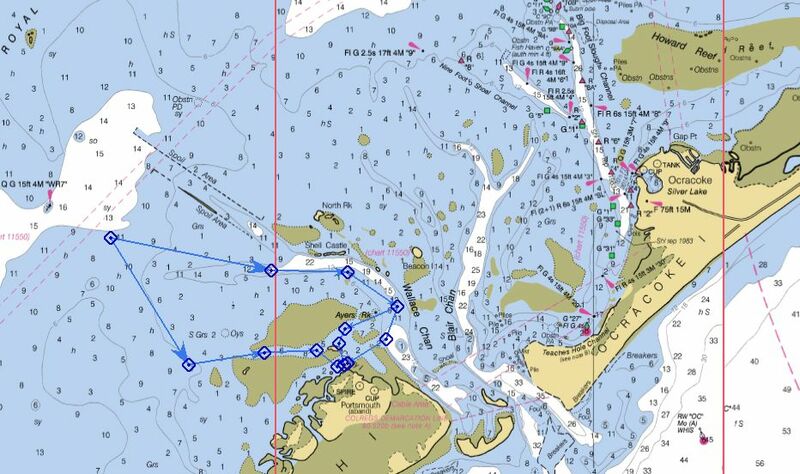 Graham wanted to explore the shoals around Ocracoke Inlet so we began our trip by retracing our track from yesterday. The wind soon dropped to around 15 kts and we had a wonderful sail back to the Wallace Channel. 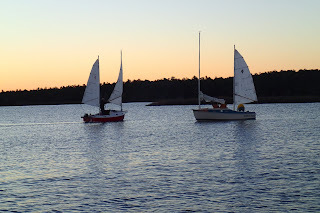 We had been on a broad reach down to Ocracoke Inlet but as we entered the Wallace Channel we had to trim in our sails and head West northwest. 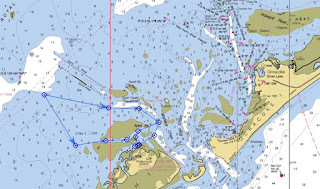 We set a course for Brant Island Shoal. We began to pull away from Graham, but then he shook out his reefs and began to pass us. I considered taking a reef out but the sun was not far from the horizon and I would rather be over reefed with darkness approaching. By the time we reached the tip of Brant Island Shoal the sun had gone down. Soon the moon began to rise. We knew this was going to happen, so I can't say we were surprised. We were tired, we had not had much sleep the night before and it had been a long day. It is getting dark and we still have 15 iles to go to the mouth of the Bay River, 20 some miles to Chapel Creek. And wouldn't you know the wind began to increase and back till it was nearly on our nose. When the wind picks up the waves on the Pamlico build very quickly. These wave were only about 2 feet but they were steep and very close together. Sally went into the cabin to switch on the navigation lights and we settled down for the long slog ahead. I removed my sunglasses but I did not want to hunt up my regular glasses so I did without, my distance vision is not very good. In the choppy conditions I found it difficult to keep the boat on course. There were a few red lights visible but I could not take the time to determine what they were. I got a magnetic course from the gps then I would try keep to that heading using the compass. After a while I would check back with the GPS. Switching my vision from looking out for waves and obstructions, (We knew there were unlit poles marking the prohibited zone near our course.) to watching the sails, to checking the compass was difficult and tiring. At last I noticed a star 10 degrees or so above the horizon right on our course. Having a star on our course made it much easier. I could stay on course while at the same time watching for the wind, waves and obstructions. We could not see Graham we knew he was somewhere in front of us. We would learn later that he was actually quite close. He could easily see our lights, but unbeknownst to us his lights were not working. Our bow plunged into one of the waves and sent water streaming up the front of the cabin and across the roof. I have never seen so much water come over the bow of SKORPA. At night for me on a sailboat everything is three times worse than during the day. We were not panicking but hunkering down aware of the growing fatigue and measuring the distance to the Bay River. Slowly almost unperceptively the waves began to diminish. Then the wind eased as we entered the mouth of the Bay River. We became more aware of navigational lights and shore lights. Suddenly some yellow lights appeared just in front of us. I thought they were reflectors on a pole or some people in a small boat fishing. Sally called out to them. I turned the boat hard to starboard to avoid running into them. Then the lights receded a couple of miles back to the shoreline. It was around 9pm when we came up to Bonner Bay. I had been looking forward to getting here for the last four hours. My plan had been to drop anchor as soon as possible and just collapse on my bunk. Now the river was quiet, the wind light, Skorpa moved steadily. All the tension had dropped away leaving relief and adrenaline. I suggested to Sally that she go into the cabin, call Graham, and change into some dry clothes. The night air was cool and we were wet and shivering. She hesitated at first to leave her post, but I assured her I would be fine. I could hear her talking on the phone." Graham we made it!!" she exclaimed. " I know" he replied matter-of-factly. " I have been watching you." We decided to continue on to Chapel Creek. We wanted to savor the moment. The magic of sailing quietly up the river at night was all the more intense because of the contrast with the wet and tense ride through the waves on the Sound. Sally fixed some crackers and cheese. They were so good. I shook out the reefs. Occasionally we could catch a glimpse of Carlita's sail up ahead. We met up with Graham in Chapel Creek very near where we knew his dock to be. Clouds had moved in to cover the moon. In the darkness we could not see any landmarks. We just headed in the direction of the dock trusting we would see it before we ran into it. Sure enough when we were about 50 fifty feet off, the dock began to take shape out of the greyness. It was a little after midnight. We had a little celebratory greeting on the dock and then we all retreated to our bunks for a quiet sleep. My boat an EC 22 was designed for and named after the Everglades Challenge Race. The Everglades Challenge is a small boat race that starts at Fort Desoto Park near Tampa Florida and ends 300 miles later at Key Largo. Three years ago Sally and I launched SKORPA at Chokoloskee and sailed down to Ponce de Leon Bay and back. I chronicled that trip in a previous post. March to the Everglades This year our plan was to watch the start of the race at Fort Desoto and then trailer our boat down to Flamingo and spend several days exploring Florida Bay. We met our cousin Karen at Fort Desoto Park. 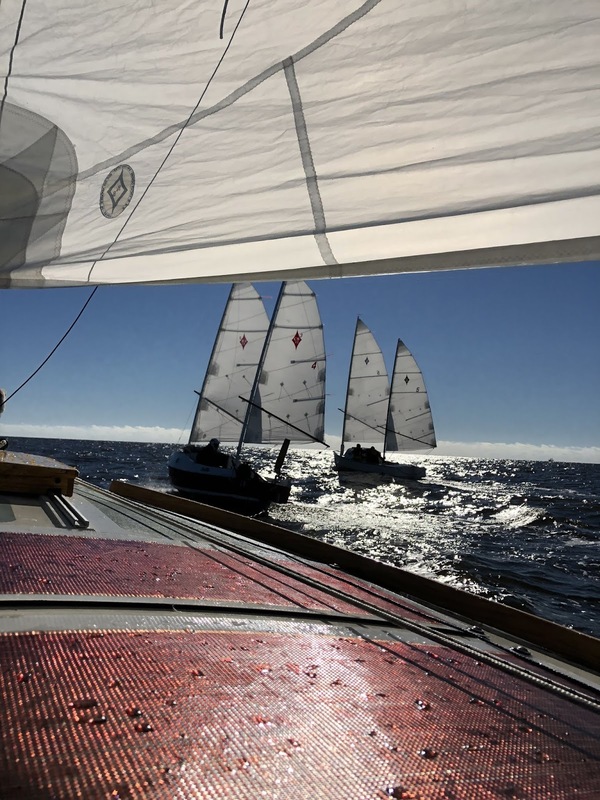 We caught up on old times while surveying the varied, and interesting line up of boats pulled above the high tide mark for the start of the race. The campground is located on St Christopher Key in Tampa Bay and the race starts on the adjoining Mullet Key. In the photo below I am looking at a tricked out CS 17 with wishbone sprit booms, a nice dodger and lots of carbon fiber. Speaking of carbon fiber, Randy Smyth's boat is a light and fast trimaran with a wing mast to boot. Looking down the beach at the variety of water craft over fifty small sailboats and 30 or so kayaks. Some boats built just for speed some built for beauty or some combination of the two. The variety of boats is amazing. Sally and Karen are looking over a new CS 17mk3. 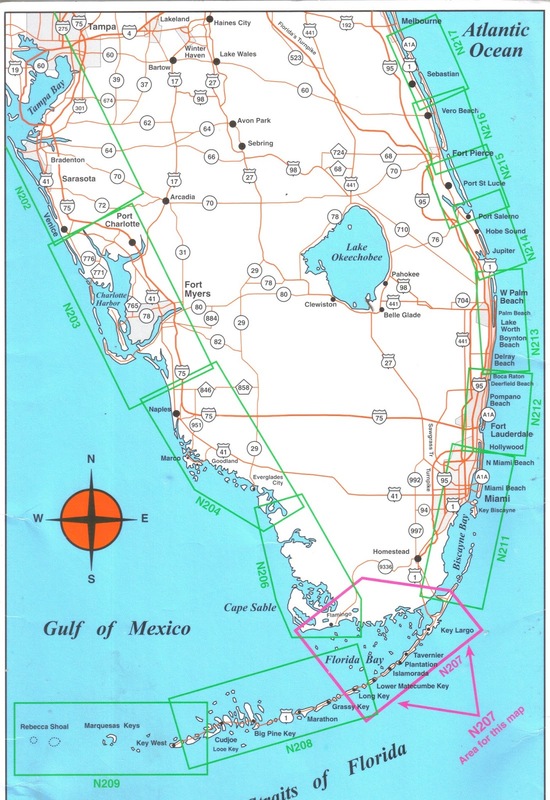 Kayaks, sailboats, and SUPs are all going to try to make 300 miles along the southwestern coast of Florida in seven days or less. We have followed the race online for several years and we know several of the participants from the annual B&B Mess-about. Below Sally greets Watertriber Sandy Bottom as she completes last minute preparations to her Kruger Sea Wind. A hug for good luck. The sun was just rising through the spans of the Tampa Bay bridge, the atmosphere was filled with a nervous excitement as the 7am start time approached and alas passed as there was to be a two hour delay in the start. Below is a link to a video of the start. After we saw the racers off, we said farewell to Karen and headed south for Flamingo. This is the view from the visitors center looking out into Florida Bay. We met two of the Watertribe race officials who were manning Check Point 3, waiting for the first racers to come in. 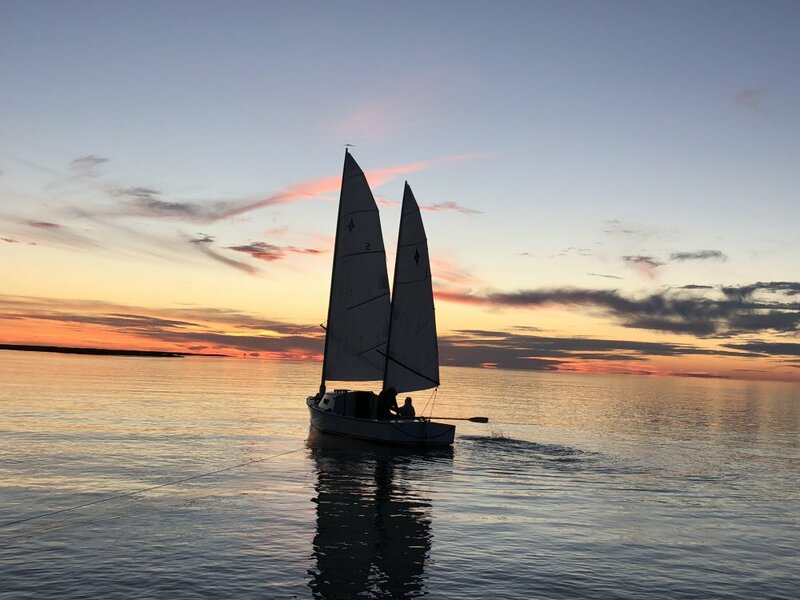 Why did we take longer than usual to get the boat rigged and loaded with food, water, and gear for our seven day excursion into Florida Bay. We sat and watched the Manatees playing in the harbor. Flamingo was still recovering from Hurricane Irma. Only one bathroom was open, and the water was off for several hours. I had been warned that the local vultures liked to peck at the rubber gaskets and wiper blades of vehicles left in the marina parking lot. The vultures were especially fond of new cars. I fastened the tent fly over the front of our new car. Finally about 1pm we were off, heading west for Cape Sable. We passed the two lead boats in the race heading east to the Flamingo check point as we headed out. The wind was out of the NE at 10-15 knots so we made good progress, but the wind backed first to the North and then the Northwest. Cape Sable is made up of East Cape, Middle Cape, and Northwest Cape. 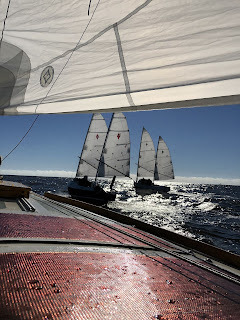 Our course now lay almost dead into the wind, a pounding chop, and a chilly breeze did not make for comfortable sailing, but we pushed on hoping to find a little shelter up close to Middle Cape. 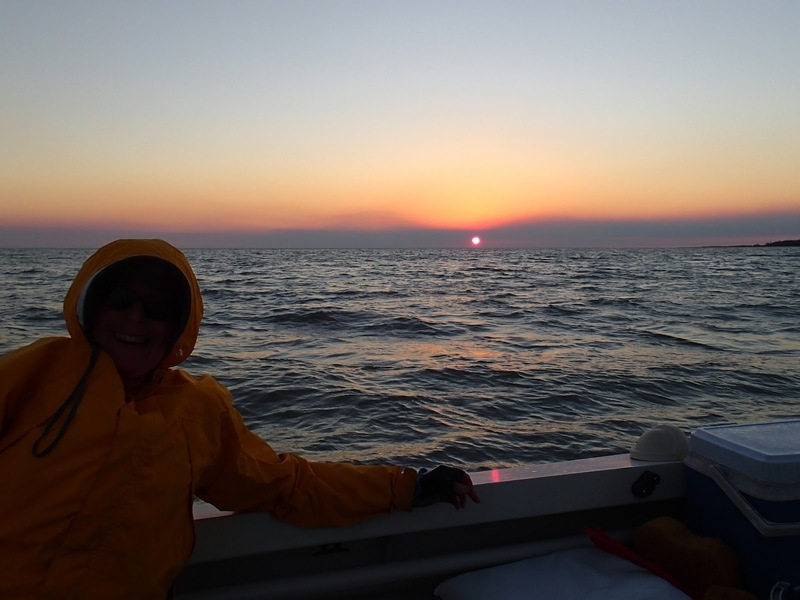 Sally is pleased that we managed to find an anchorage before the sun set. In the morning we moved Skorpa in close to shore and got out for a beautiful walk. We were now about 12 miles from our southern most anchorage on our trip out of Chokoloskee three years ago. Miles and miles of pristine beach. Nest day we were off heading south. We did not have a destination just a direction, but as the day got later we decided to anchor off Sandy Key. Sandy Key is posted with signs asking visitors to stay away. Hundreds of birds use it as a rookery. White Pelicans, Brown Pelicans, Herons, Egrets, numerous smaller birds. There seemed to be no room left on the branches. The quiet Florida night was interrupted frequently with squawking and shrieking. We decided to leave them their space and enjoyed watching through binoculars so I don't have any photos that do Sandy Key justice. 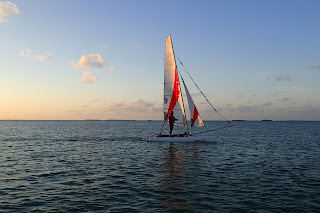 In the morning we set off to explore Man of War Channel to get a feel for what it would be like exploring the shallows of Florida Bay. We got through the channel no problems. On the other side we explored Johnson Key and the photo below is the Johnson Key Chickee. We anchored close to Man of War Key for lunch. If you look closely you should be able to make out the Brown Pelicans roosting in the Mangrove branches. During our lunch stop we heard a favorable weather forecast for the next few days. We decided we would try to make the run to Key Largo about 30 miles away. As we approached Long Key one of the Watertribe racers caught up with us. His name was Bjorn. He asked how far to Key Largo. I told him 20 miles or so. He was tired and cold but wanted to press on. He was hoping we would accompany him. He was disappointed when I told him we were going to stop for the night at Lignumvitae Key. Lignum vitae is a much sought after tropical hardwood, hard and durable. The Key named after the wood is a beautiful nature preserve tucked up beside the developed Keys that lay along Route 1. I wished we had taken some time to explore it, but we headed off for Key Largo. 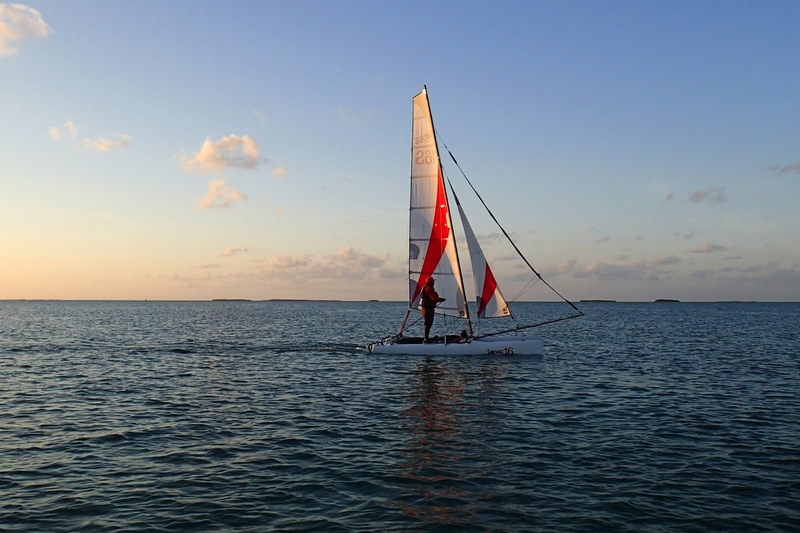 We arrived at Key Largo, the finish of the Everglades Challenge on Wednesday afternoon. Several Watertribe racers had already finished, but most were still out on the course. 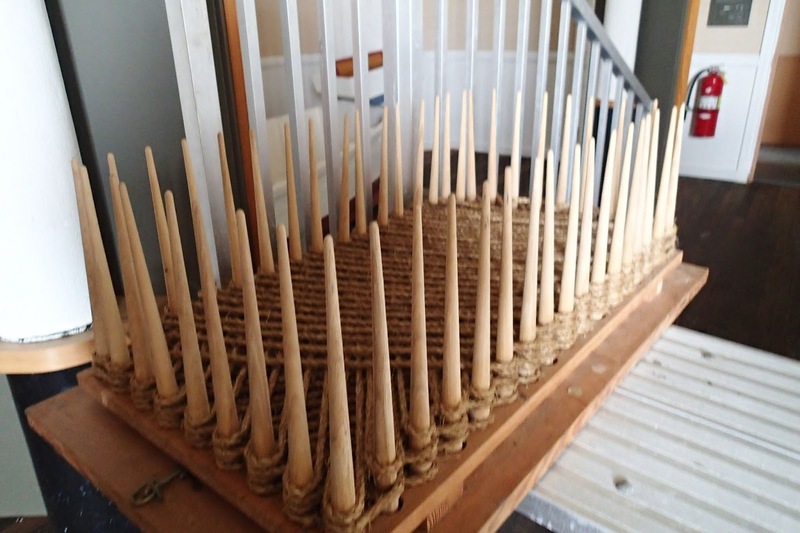 They would arrive singly and in small groups over the next few days. 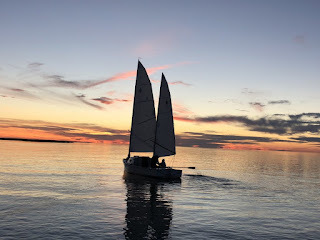 We spent the days ashore visiting with friends and making new ones and enjoying the amenities of Key Largo like hot showers and Mrs Mac's Kitchen. View of the finish line at Key Largo. J.F. 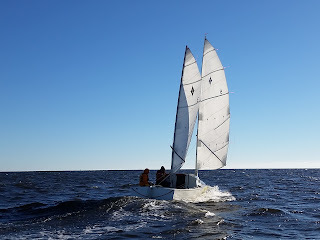 Bedard is taking out Matt Layden's Illusion for a test sail. A Bolger Sneakeasy powered by Photovoltaic panels hums across the finish line. Enjoying a night out a Mrs. Mac's! The wind blew hard out of the North for a couple of days. When on Saturday the wind veered to the southeast we decided it was time for us to attempt a crossing of Florida Bay to Flamingo. Florida Bay looks like a lot of open water dotted with low Mangrove covered islands, but much of that water is only a foot or two deep. To complicate matters the water level rises and falls in a twice daily lunar cycle in some parts of the bay but not in others. The wind can also affect the water level by three feet or so. 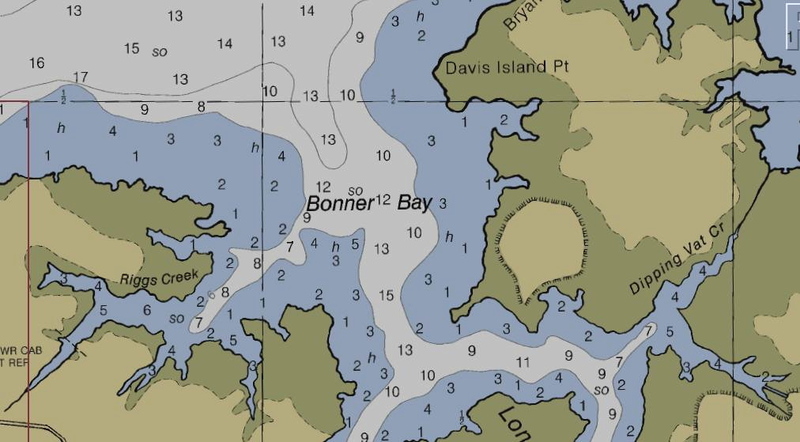 Traversing the bay can go from a pleasure cruise to a nightmare. The bay can go from mostly water to mostly mud for a day or two or several days. Below is a link to some videos of our crossing. When we left Key Largo we had a 15knot wind from the South southeast. We were on a reach with pretty smooth water. Our boat speed was about 8 knots. Here are a couple of videos of us negotiating some of the shallower areas. The channels have colorful names like Twisty Mile and Crocodile Dragover. We had it pretty easy as the water level was about "normal". It was truly satisfying to slip back into the little harbor at Flamingo. No motor, no noise, just the sails bringing us in through the tight entrance. We didn't even use the oars. On the way out of Flamingo we stopped at a couple of the waysides to view some of the remaining Mahogany Trees. And to say farewell to Pay-Hay Okee, Grassy Waters!